Unquestionably, Doug and the Slugs are one of the most distinctive and entertaining Canadian bands of the last 30 years. 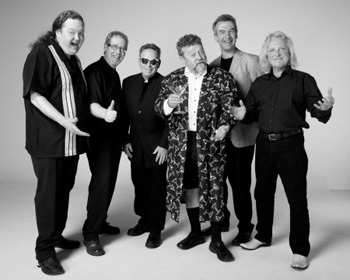 Their upbeat musical style, musicianship and offbeat stage antics have made them a staple of the Canadian music scene for decades. Formed in Vancouver in the fall of 1977, the band originally consisted of Doug Bennett, John Burton (guitar), Drew Neville (keyboards), Dennis Henderson (bass) and Lawrence McGillveray (drums). In the fall of 1978 there were significant personnel changes within the band. Doug and John remained - they were joined by Simon Kendall, Richard Baker, Steve Bosley and John ‘Wally Watson’. Within a few months the Slugs were the hottest attraction in the Vancouver area. They were playing Monday through Saturday at the most popular live music venues in the city that were lined up every night. The rest is history - The Slugs toured relentlessly and went on to produce 6 more albums (3 of them certified Gold) and proved to be a ‘national treasure’. The band also had international releases in the US, Europe and Australia. They had underground success and critical acclaim in America, and helped launch the video era with Slug videos among the first getting heavy rotation on MTV, due to their film-like quality and humour. Indeed, the Slugs wondered if they could ever continue without Doug. For several years they did not even consider the idea, until Bernie Aubin suggested they call Ted Okos, a journeyman rocker for many years with the band ‘Nick Danger’. Ted and the original slugs, John Burton, Simon Kendall, Steve Bosley, Wally Watson and Richard Baker, hit it off immediately. Ted’s high energy delivery and warm, but slightly irreverent stage antics, and his keen understanding of the essence of the songs, made him the obvious choice for a rebirth of ‘Doug and the Slugs. Noteable Entertainment & Events is a Vancouver based booking agency, party rental, entertainment services and event production company. If you are interested in booking Doug & The Slugs please contact us.